The first war of independence launched by Gandhi and what Anna calls the second war of independence has much in common. The quit loot movement is in fact is a much harder mountain to climb than the quit India movement. 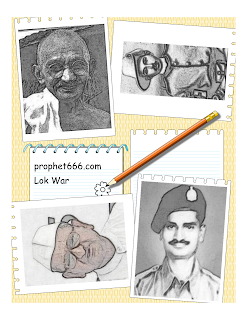 Gandhi and Hazare have much in common, apart from their frugal lifestyles, both had military service behind them. Gandhi never compromised with his principles, come what may; nor I hope will Hazare. India and Indian have no option, other than to fully support and actively participate in Lok War. What ever the agents of the looters might tell you, governance in India is in a state of collapse. There are just two options left support Anna or face total collapse. Wishing the quit loot movement a very successful 2012.